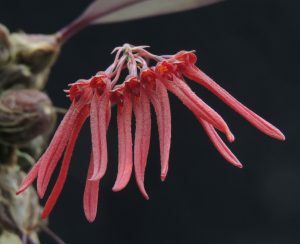 We are fortunate to have a number of interesting little bulbophyllums in flower this week and the star amongst them is this species from South East Asia with masses of deep red flowers on a miniature plant. 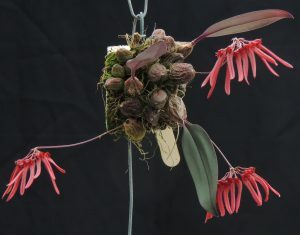 The species is reported from 600-2000m but with us it definitely prefers to grow on the cooler side compared to many of our bulbophyllums from the same region. We find it grows and flowers best mounted in Cool Americas (perhaps it enjoys having a holiday) rather than out Warm Asia section. With three flowers out it is a splendid thing but unfortunately it is likely to be over before the Three Counties Show (at the Malvern Show Ground next Friday -Sunday). p.s. thanks to Ching Hong Tan for helping us to name it correctly after we posted it in flower last year.